August is a month of too much. It’s too hot. The kids have been home for too long. There are too many flies. There’s too many zucchini in the garden. It’s too hard to hold on to a writing habit. The dog days of summer snap my patience, but rather than harangue myself (for letting my writing wilt) or yelling at my kids (for driving me batty) or berating you (for being a silent blog reader), I throw us all a life line of exquisite writing and will meet you in September. 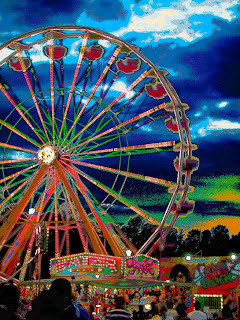 The first week of August hangs at the very top of summer, the top of the live-long year, like the highest seat of a Ferris wheel when it pauses in its turning. The weeks that come before are only a climb from balmy spring, and those that follow a drop to the chill of autumn, but the first week of August is motionless, and hot. It is curiously silent, too, with blank white dawns and glaring noons, and sunsets smeared with too much color. Often at night there is lightening, but it quivers all alone. There is no thunder, no relieving rain. These are strange and breathless days, the dog days, when people are led to do things they are sure to be sorry for after. Excerpt from “Tuck Everlasting” by Natalie Babbitt.